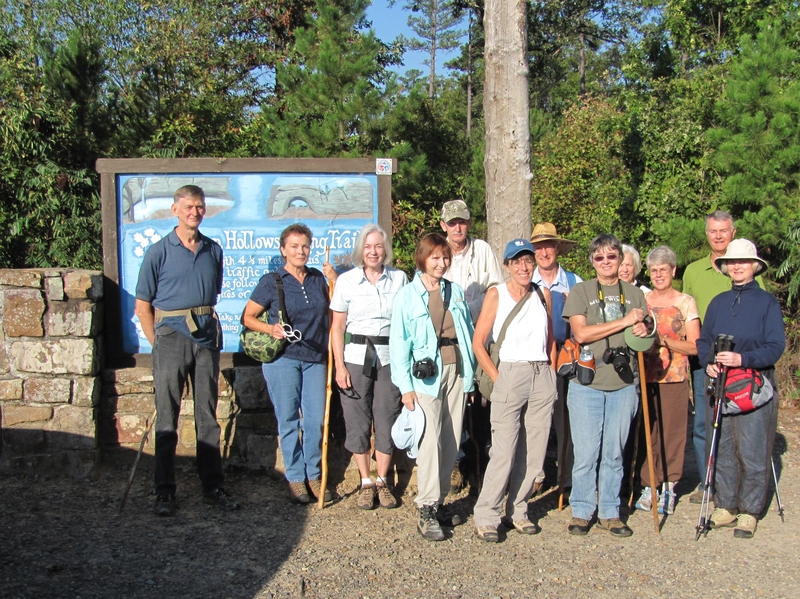 Accompanied by the gentle, constant pitter-patter of variable oakleaf caterpillar droppings, thirteen Arkansas Native Plant Society (ANPS) members ventured into the wilds of Natural Bridge Hollow on Petit Jean Mountain on October 4th. The mid-morning temperature was perfect for four hours of nearly sweat- and bug-free adventure led by Don Higgins, author of this article. I wanted to show the group a couple recent finds of Ozark Chinquapin (Castanea pumila var. ozarkensis or Castanea ozarkensis, as people prefer), so we took our time and stayed within the drainage of Natural Bridge Hollow, which is the eastern portion of Petit Jean State Park’s popular Seven Hollows Hiking Trail. It’s not just an area of stunning natural beauty, it’s also home to several documented archeological sites spanning prehistoric and historic activity. The Hollows are a series of more or less parallel canyons running southwards on the west end of Petit Jean Mountain. Geologically, the topography resulted from the dissection of the Mountain’s caprock of Hartshorne sandstone. Thus everything derives from quartz, clay, and organic matter; there’s absolutely no limestone here as there is north of the Arkansas River in the Ozark plateau. Sandstone and shale layers conduct water to never-failing springs at several places in the hollows. Plants higher on the caprock sometimes have to endure near desert conditions, especially this year. Prehistoric activity here is traced by the presence of red ocher pictographs and engraved petroglyphs adorning sandstone shelters. Prohibition brought “industrial activity” to the area, in the form of numerous moonshine stills. 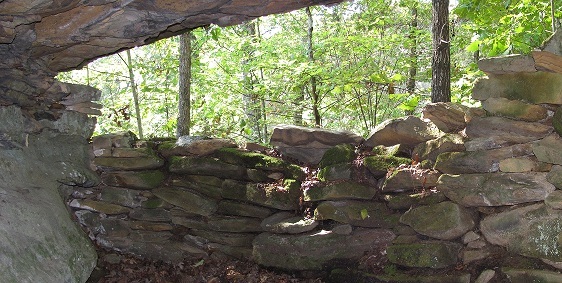 After Arkansas’s first state park came into being in 1923, the National Conference on State Parks sent its field secretary, Raymond Torrey, to Petit Jean in 1926, and one of his earliest observations to appear in the Arkansas Gazette, was the following: “Of more recent human interest were plain indications that some of the caves had been used by moonshiners, whose fireplaces, barrels, other utensils and stores of dried, smokeless hickory, remained after the sheriff, in a raid some months ago, destroyed or confiscated the more essential parts of their apparatus.” Now closing in on ninety years later, we ANPS visitors were yet able to spot planks, pipes, barrel hoops, and towing equipment among the refuse left behind by the ’shiners. Across the creek at one spot we found a cleverly walled-in cavern constructed to hide such an operation from even the keenest Revenuer’s eyes. But, as always in these hollows, the variety and number of plants were a major attraction. With the odd situation of spring-like weather following a dry, hellish summer, many flowering plants were fooled into thinking they needed to start reproducing. The star of the show for me was a thirty-odd foot Ozark chinquapin. Plentiful in the 1950s, I only know of four of these trees on the Mountain now, and none produces burrs. Perhaps, since there are at least two in this particular hollow, when the second reaches flowering age there may be some nuts produced—providing, of course, that the chestnut blight doesn’t get them first. After a couple hours of cussing and discussing tricky species, and agreeing on many others, we emerged from the canyon with the chinquapins and hit the main trail again. The hardier of us turned right and continued along the 4.5 mile loop, while those of us who were ready for lunch turned left and headed for the newly-refurbished Mather Lodge for a satisfying lunch. Grasses – Pink, diffuse purple lovegrass (Eragrostis spectabilis) and darker, denser, purpler purple top (Tridens flavus), both in flower with wind-pollinated anthers dangling. Three species of bluestem grass: little bluestem (Schizachyrium scoparium), big bluestem (Andropogon gerardii), and the weedy broomsedge (A. virginicus). River oats (Chasmanthium latifolium) coming into fruit and a variety of panic grasses. Shrubs – A lot of serviceberry/sarvisberry (Amelanchier arborea), but no large specimens and none with fruit. A profusion of beautyberry (Callicarpa americana), the purple berried variety. Farkleberry, high-bush blueberry (Vaccinium arboreum). New Jersey tea (Ceanothus americanus), the he-huckleberry, maleberry (Lyonia ligustrina) and possibly a mayberry, Elliott’s blueberry ( Vaccinium elliottii), though this sighting is somewhat in doubt as the elliotti usually doesn’t grow that far north. Trees – Both winged and smooth sumac (Rhus copallinum and Rhus glabra) together on sunny upland and in the woods, fragrant sumac (Rhus aromatica). Ozark chinquapin (Castanea ozarkensis), up to 30 feet tall. Fringe tree (Chionanthus virginicus) and sassafras (Sassafras albidum), Mexican plum (Prunus mexicana) with unripe fruit. Under the cliff, on the walk to the chinquapin and bootlegger hideaway, very large specimen trees of red maple (Acer rubrum), black gum (Nyssa sylvatica), white oaks (Quercus alba) loaded with caterpillars and northern red oaks (Quercus rubra). Dogwoods loaded with fruit. Wildflowers – Rushfoil (Croton willdenowii/Crotonopsis elliptica) abundant in upland glades, accompanying the bluestem grasses. Blue sage (Salvia azurea), alumroot (Heuchera sp. ), long-bracted wild indigo (Baptisia bracteata). Several goldenrods in flower, the most common old field goldenrod, (Solidago nemoralis). A small patch of fragrant goldenrod, (S. odora), with licorice-scented leaves when crushed. Ladies tresses orchid, probably (Spiranthes cernua). Leaves of crane-fly orchids (Tipularia discolor) just up out of ground for its active winter season. Elephant’s foot (Elephantopus tomentosus) or devil’s grandmother, under low-hanging ledge where it suggested very small elephants. Dittany, known as wild oregano (Cunila origanoides) in flower. Flowering spurge (Euphorbia corollata) still in nice flower and fruit. Spiderwort (Tradescantia sp. ), milfoil (Achillea millefolium), butterfly pea (Centrosema virginianum), bee balm (Monarda sp. ), and a species of Ranunculus. Two species of small, annual Hypericum, nearly leafless orangeweed (H. gentianoides) and nits-and-lice (H. drummondii). The orangeweed’s leaves produce an orange aroma when crushed. Hawkweed (Hieracium gronovii), a fuzzy dandelion-like composite with bright yellow heads. White snakeroot (Ageratina altissima), slender or narrowleaf mountain mint (Pycnanthemum tenuifolium). Rough blazing star (Liatris aspera), one with a gulf fritillary. Several asters were in flower, the most common, Aster patens AKA Symphyotrichum patens. Hemiparasitic lousewort or wood betony (Pedicularis canadensis). Vines – Vines of interest included cross vine (Bignonia capreolata) and the much smaller partridge berry (Mitchella repens) in two-eyed fruit and once with a pair of flowers. Ferns – Several ferns, including southern lady fern (Athyrium filix-femina var. asplenioides), Christmas fern (Polystichum acrostichoides), common woodsia (Woodsia obtusa), and a grape fern (Botyrichium dissectum forma dissectum) with a fertile stalk. Grape fern, like the crane’s fly orchid, goes underground for the summer, but was up and thriving for the winter season. Editor’s note. Don Higgins lives on the mountain, exploring and learning about the history. He is an ANPS member who loves this trail and knew we would have a great experience exploring the hollows. We appreciate his leading this hike. This entry was posted in Field Trips and tagged Arkansas Native Plants, Castanea ozarkensis, Castanea pumila v. ozarkensis, Ozark Chinquapin, Petit Jean Mountain, Petit Jean Mountain State Park, Seven Hollows Trail. Bookmark the permalink.